Mr. “S” also had a cave in from all the rain. We built for him a 3″ Insulated aluminum patio cover in Almond color with dark bronze trim, beam and gutter. Pardon the mess in the picture, I don’t have a picture of the complete patio cover but it’s almost done here. Most definitely the downspout was not left that way, lol! 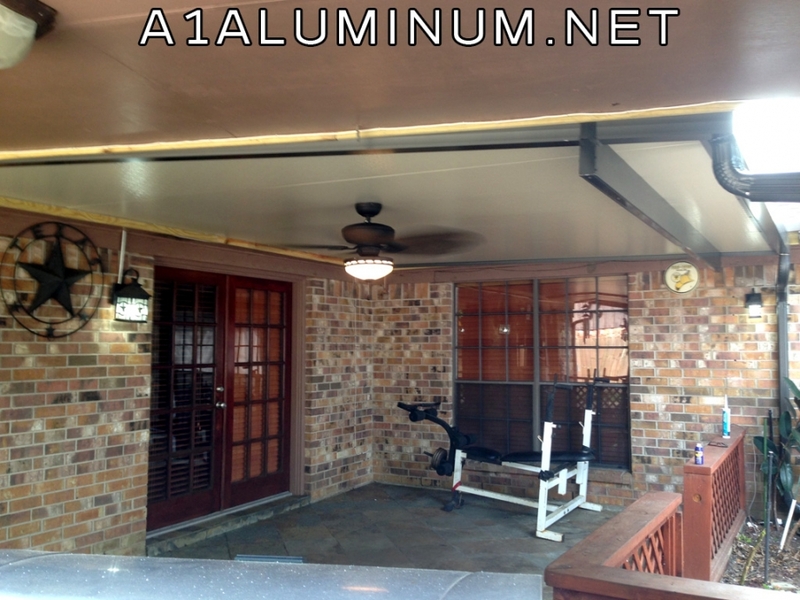 Mr. “M” in Houston wanted a patio cover as a place to have family gatherings on the weekend. He loved the Ivory color because it matched the trim on his house perfectly. This patio cover was built a few months ago when we were having all that rain that just would not stop. Ms. “T” called us to say her cover had caved in from the rain and could we come out and build a new one. She was thrilled to have her new patio cover. A lot of times these older covers are not manufactured anymore so insurance has to pay for a complete new one comparable to what you had. We deal with insurance claims and Windstorm certificates all the time so if this happens to you, give us a call. Mr. “A” wanted a gabled carport. Everyone that came out before us to give him a bid wouldn’t do it for him. We told him we could do it and he couldn’t be happier! Mr. “O” in Conroe wanted that extra height so we built him a steel patio cover and raised it over the roof line. He even joined in and helped us work!